Welcome to my new series! My goal is to give you a new recipe every week that you can easily make in your dorm room. Each meal will cost $10 or less, and take 10 minutes or less to prepare. All you’ll need is a role of aluminum foil, a regular kitchen spool, a solo cup, a knife, and access to the oven in your common room. Today’s recipe is for pesto chicken which is also gluten free and makes 2 full meals. 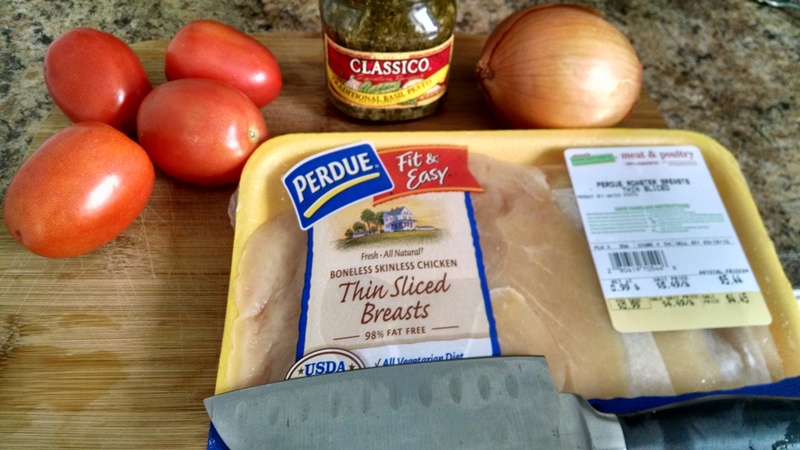 Pesto Chicken – Gluten Free Option! It seems like only a few ingredients but for $8.39 it makes two full meals. Layer two sheets of aluminum foil on top of each other large enough to hold both breasts of chicken. Crimp up the edges of the foil to give it the appearance of a dish. Dice two of the tomatoes and half of the onion. Place tomatoes and onion on two sheets of aluminum foil. Place 1 tablespoon of butter on top of the vegetables. For measuring the butter, either use one pre-packaged butter packet (about 1 tablespoon) that can be found in the cafeteria or simply look at the measurement lines on the side of a stick of butter from the grocery store. Wrap foil into a ball. Place chicken and two foil balls in oven. Cook for 45 minutes. Cooking times for chicken may change based on the cut of meat you buy. For instance, thin cut breasts will cook much faster. For best results, but a meat thermometer and cook chicken until the center of the meat reaches 165 °F. Dice up the chicken into bite-sized portions. Place one of the diced breasts of chicken and the contents of one of your foil balls into a solo cup. Add 3 heaping spoonful’s of pesto sauce to the cup and mix. Repeat process for the remaining ingredients. Time to eat! You can eat the first serving right out of your solo cup, then cover the second cup in foil and put it in your fridge for later. And be sure to comment below with how you did on this dish and tune in next week for a special dessert that will definitely satisfy!